This interagency five (5) year, multi-million dollar study focuses on the exploration and investigation of deepwater biological communities located in U.S. federal waters of the Atlantic Ocean (Virginia to Georgia). Results of the completed program will provide energy resource information needs for future offshore leasing of the Outer Continental Shelf in the mid and south Atlantic regions and information on the continental slope ecosystems. The fourth ocean research mission off the U.S. southeast coast began April 9 as scientists depart from Charleston, S.C. for the next phase of the DEEP SEARCH project. Sailing aboard NOAA Ship Ronald H. Brown, the expedition will explore and characterize seeps, corals, canyons, and associated fauna along the Atlantic margin between Virginia and Georgia. From April 9 to 30, 2019, DEEP SEARCH scientists will collect critical baseline information about deepwater habitats offshore the U.S. Mid- and South Atlantic coasts. A new video captures highlights of the August 2018 expedition on the RV Atlantis using the submersible Alvin. This expedition characterized an 85-mile stretch of Lophelia coral located 160 miles off the South Carolina coast. 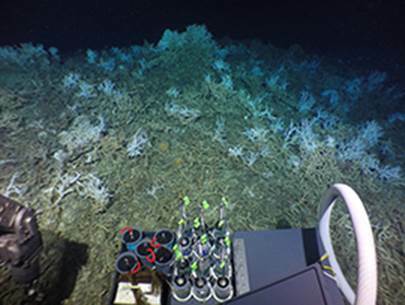 DEEP SEARCH is the acronym for DEEP Sea Exploration to Advance Research on Coral/Canyon/Cold Seep Habitats. Fieldwork began in 2017 under the National Oceanographic Partnership Program (NOPP). The mapping surveys were accomplished with the NOAA Ship Okeanos Explorer through coordination with NOAA OER. In October 2018 on TDI-Brooks’ ship, the RV BROOKS McCALL, two Royal Netherlands Institute of Sea Research (NIOZ) designed benthic landers were deployed to measure near-bed environmental conditions over longer time scales (~year) at a cold-water coral reef and a canyon site. Also, sampling was conducted including Jumbo Piston Cores collected at selected features of interest (e.g., mounds). TDI-Brooks are global experts when it comes to scientific expeditions and furthering ocean awareness. TDI-Brooks International, Inc recently deployed the R/V Brooks McCall to Belize and joined the Blue Hole Expedition.